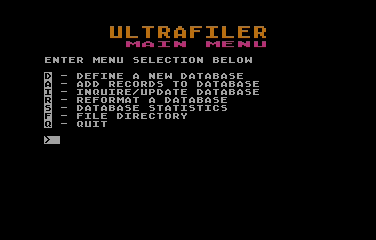 ULTRAFIL.DCM is an Atari 8bit application which is a filing (database) system. 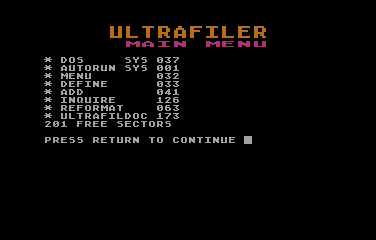 It is written in Atari BASIC with two machine language portions. The entire disk has been DISKCOMMed which naturally explains the extension .DCM. 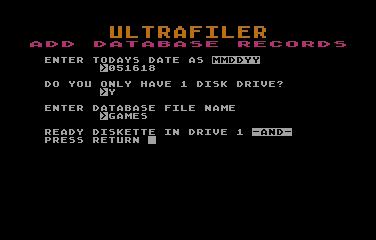 This disk contains 5 BASIC programs, an AUTORUN.SYS that automatically starts the menu program on bootup and an 80 column text file containing full documentation for this system. I wrote the system almost 10 years ago for my own use and wish to place it in the public domain for others to use and enjoy. I use it to keep track of my VCR tapes, software collection, household inventory, and magazine articles. It was used several years ago to maintain a 1200+ name and address mailing list. The documentation was written with the intention of submitting the system to ANALOG, but the magazine folded; hence, the references to typing in the programs.